Pentagon Deploying 3,750 Troops To Southern Border U.S. service members will install wire barriers and help monitor the border. However, some in Congress have questioned whether it's a good use of active-duty troops. 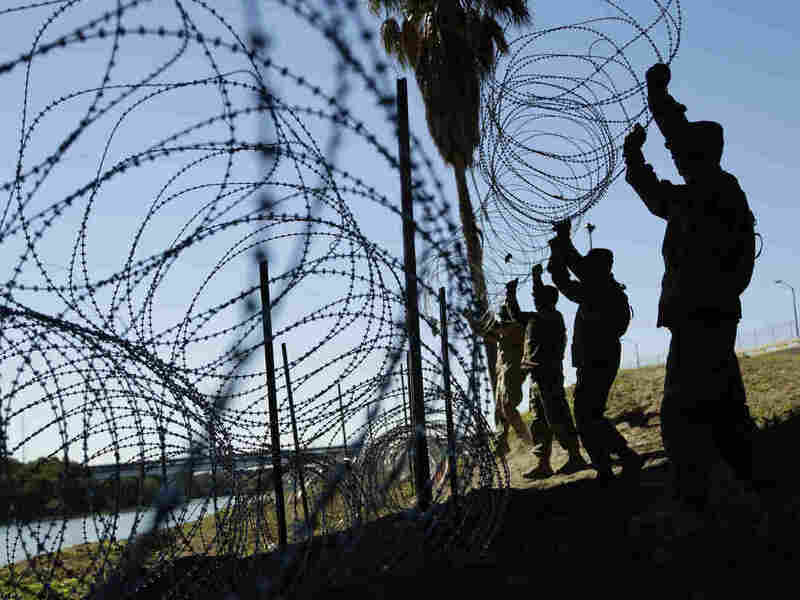 Members of the U.S. military install multiple tiers of concertina wire along the banks of the Rio Grande near the Juarez-Lincoln Bridge at the U.S.-Mexico border in Laredo, Texas, in November. An additional 3,750 troops will be sent to the Southern border to help install wire barriers and monitor crossings, officials said. The new deployment will bring the number of active-duty troops there to around 6,000. In a tweet on Sunday, President Trump said that "STRONG Border Security" is necessary in the face of "Caravans marching through Mexico and toward our Country." The announcement of new troops on Sunday comes just days before Trump is expected to discuss border security measures during Tuesday's State of the Union address. With Caravans marching through Mexico and toward our Country, Republicans must be prepared to do whatever is necessary for STRONG Border Security. Dems do nothing. If there is no Wall, there is no Security. Human Trafficking, Drugs and Criminals of all dimensions - KEEP OUT! Acting Defense Secretary Patrick Shanahan said Thursday that the troops would be deployed to the border over the next month, NPR's Tom Bowman reported. They'll join the 2,300 active-duty troops already there, bringing the total to about the same number as were deployed last fall. An additional 2,100 National Guard troops are also stationed there. Some in Congress have criticized the use of active-duty troops to perform the same tasks assigned to the National Guard. Both active-duty and National Guard troops are assisting U.S. Customs and Border Protection with logistics and other support. But apprehending migrants is not part of their assignment. The U.S. military is prevented by law from carrying out law enforcement duties within the United States. Last week around 2,400 migrants left a city shelter in Mexico City on their way to the U.S.-Mexico border, Reuters reported. When Defense Department officials testified before the House Armed Services Committee last week, they didn't mention the upcoming troop deployment. Rep. Adam Smith, D-Wash., who chairs the committee, released a statement criticizing what he called a lack of transparency. "I am deeply troubled that the witnesses did not disclose the upcoming increase in guard, reserve, and active duty personnel, even though we asked them multiple times during a two-and-a-half-hour hearing what would happen next on the border," Smith wrote, echoing concerns in a letter he wrote to Shanahan. That omission raises questions about whether the troop increase "is so unjustified that they cannot defend an increase in public," he wrote. Trump suggested Friday that he would announce action on a border wall during the State of the Union address, which will take place Tuesday. "I don't want to say it, but you'll hear the State of the Union, and then you'll see what happens right after the State of the Union," he told reporters.